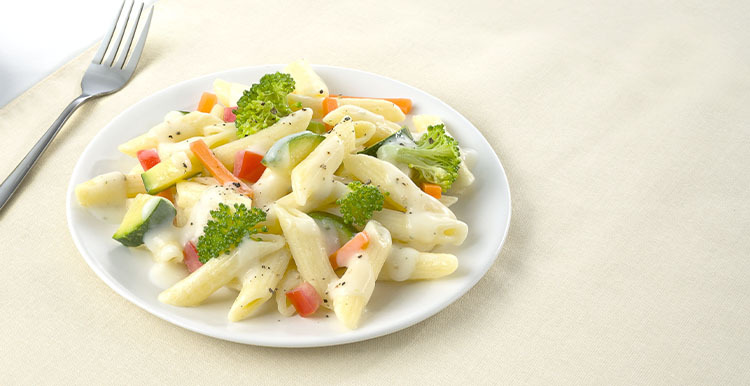 This classic comfort dish features penne pasta, zucchini, tomatoes, broccoli, and carrots delicately combined in a rich Parmesan and Romano cheese sauce. Ingredients: REDUCED FAT MILK (REDUCED FAT MILK, VITAMIN A PALMITATE, VITAMIN D3), COOKED ENRICHED PENNE PASTA (WATER, DURUM WHEAT, EGG WHITE, NIACIN, FERROUS SULFATE, THIAMINE MONONITRATE, RIBOFLAVIN, FOLIC ACID), ZUCCHINI, TOMATO, BROCCOLI, CARROT, WATER, PARMESAN CHEESE (PART-SKIM MILK, CHEESE CULTURES, SALT, ENZYMES), ROMANO CHEESE (NONFAT MILK, CHEESE CULTURES, SALT, ENZYMES), MODIFIED FOOD STARCH, RESISTANT MALTODEXTRIN, SALT, WHEY PROTEIN ISOLATE, GARLIC (GARLIC, WATER), LEMON JUICE FROM CONCENTRATE (WATER, CONCENTRATED LEMON JUICE), YEAST EXTRACT, SPICES. Nutrients: REDUCED FAT MILK (REDUCED FAT MILK, VITAMIN A PALMITATE, VITAMIN D3), COOKED ENRICHED PENNE PASTA (WATER, DURUM WHEAT, EGG WHITE, NIACIN, FERROUS SULFATE, THIAMINE MONONITRATE, RIBOFLAVIN, FOLIC ACID), ZUCCHINI, TOMATO, BROCCOLI, CARROT, WATER, PARMESAN CHEESE (PART-SKIM MILK, CHEESE CULTURES, SALT, ENZYMES), ROMANO CHEESE (NONFAT MILK, CHEESE CULTURES, SALT, ENZYMES), MODIFIED FOOD STARCH, RESISTANT MALTODEXTRIN, SALT, WHEY PROTEIN ISOLATE, GARLIC (GARLIC, WATER), LEMON JUICE FROM CONCENTRATE (WATER, CONCENTRATED LEMON JUICE), YEAST EXTRACT, SPICES.